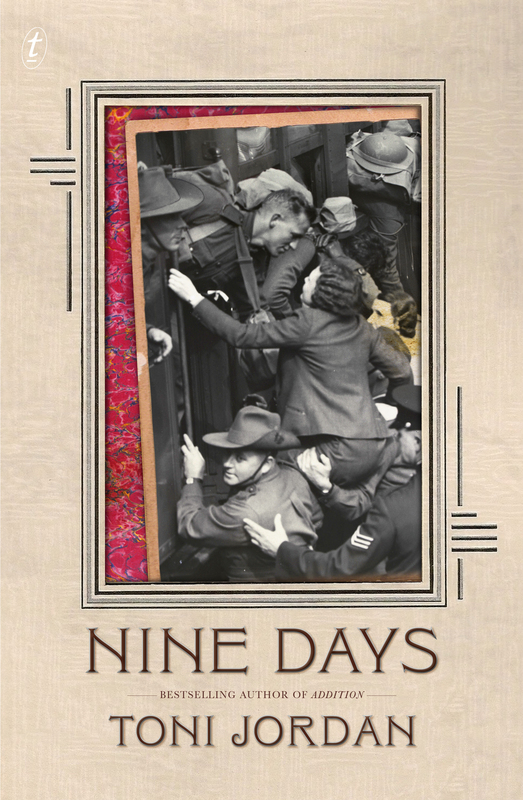 Toni Jordan’s latest novel, Nine days, is somewhat of a departure from her first two novels which are more in the chicklit vein, albeit chicklit with a difference. The thing is, I don’t generally read chicklit, but I did enjoy Addition and Fall girl, so I was more than willing to read Jordan’s next offering. I was not disappointed. Nine days was, according to the Author’s note, inspired by a photograph from the State Library of Victoria’s Argus collection. The photograph forms the cover of the book’s first edition: it depicts an unidentified soldier leaning out of a train window to kiss an also unidentified young woman. Jordan has woven around this photo a multi-generational story that spans six decades or so from the eve of world war 2 to the present. The title refers to the nine days upon which the book’s nine chapters are built – with an added complexity. This is a multiple point of view novel like, say, Christos Tsiolkas‘ The slap and Elliot Perlman‘s Seven types of ambiguity, but while those two novels progressed their narratives in a linear chronology via the changing voices, Jordan’s chronology jumps around in a seemingly chaotic manner. However, there is method to it, because careful reading reveals thematic or structural connections, even if not chronological ones, between each chapter. That’s the basic structure, but the real interest of course is in what the novel’s about. How, though, to describe the plot of such a novel succinctly? The best way is to simply say that the novel tells the story of three generations of one family, which is, by the way, an impressive thing to attempt in 250 pages. There is a central mystery – for the reader and for the family though they aren’t necessarily aware of it – to do with the two figures in the photograph. Each chapter is named simply for the character in whose first person voice it is told. The first is Kip, a nearly 15-year-old boy in 1939, who has just had to leave school and go to work because of the recent death of his father. Other chapters are told by his twin brother Francis/Frank (who gets to stay at school), his mother Jean, and his much loved big sister Connie. Interspersed with their stories are those told by Kip’s wife, Jack who lives next door, Kip’s twin daughters, and even his grandson. For each person something happens – some choice must be, or is, made – in the particular day they describe, which impacts their life’s direction. I’ve wasted my whole entire existence up to now. I’ve done absolutely nothing with it. I’ve just been counting down the months of my life. Sixteen years, totally useless. I live with three women. A big night at my place is when the ABC runs a Jane Austen marathon. God I hate that Bennet chick. Marry him already, and spare us the drama. Another reason the book works is that Jordan manages place and time well. Counterbalancing the seemingly erratic chronology is the fact that place is kept simple. The whole novel occurs pretty much in one suburb in working class Melbourne. This helps keep we readers grounded, as do two little motifs – a “lucky” shilling and a purple pendant – which appear on and off throughout the novel. I was initially concerned, after the first couple of chapters, that the shilling was going to be a little heavy-handed or mechanistic – particularly given the shilling graphic commencing each chapter – but it’s not. Like the pendant, it appears in some, but not other, chapters, and in so doing helps keep us focused without irritating us. In other words, the book is handled very well technically. But, that’s not what makes a book, in the end, is it? What makes a book good is its heart – and the heart of this book is warm but real. Its particular subjects are war, abortion, religious and class difference, social conscience and social mobility, but it is also a universal tale about how love (marital, romantic, sibling, parental, and so on) forms the glue that keeps us going. This might sound corny, but that’s not how it comes across. The novel has its share of grittiness; and relationships have their tensions, conveying the message that love (whether marital, sibling or parental) is not a simple endpoint but something to be worked at. This may not be the book for readers who like long family sagas they can lose themselves in, but for those like me who enjoy works which tease and leave ties undone, much like life really, Nine days has plenty to offer. This is a beautiful review. I love knowing how the idea for a book came about – that photo looks so romantic…almost a kiss but not quite. Thanks Delia … It’s a great story, that is, her inspiration for this. I love hearing the why/how behind books too. What was the inspiration and then how do they get started. Fabulous review Sue. I’ve seen this one around a bit, and was vaguely interested- I read Addition, and loved it. Now of course I’d love to read this one. I was intrigued enough by your review, but then that quote! Fabulous. I love her sense of humour. I do really enjoy the multi-POV too. Now to find the time. Thanks Louise. I think you’d like it … It’s short too. I like her humour and am thinking of posting something more from it. She has a good ear for character’s voice I think. Sounds like an accomplished and heartfelt read, perhaps what Toni Jordan was really aiming for? I love the idea of a photograph inspiring decades of stories – such luscious possibilities of invention! Likable despite faults – I think you’re right, that is the mark of a truly great writer. Without faults, the characters aren’t real, but without likability, how can we truly care for them? Exactly Hannah … And we do, mostly, want to care about the characters we read about don’t we. Ah, firstborns! Anyhow, good luck with getting a copy. It’s very readable despite its chopping around, booknaround. All that in only 250 pages? Impressive. I had to laugh at your description of Stanzi and Charlotte. Stanzi could almost be my younger sister and I could almost be Charlotte. I just finished Fall Girl and I also enjoyed Addition. This one seems definitely different, thanks for the review, I’d like to read it. Thanks Emma … I liked Addition a little better than Fall Girl, but this one is definitely different and well worth giving ago. Glad you liked the Austen quote … But sorry your husband would agree with it!! Great review. Nicely and elegantly summed up. I’ve just finished Addition as well and am torn between the two. I thought I was going to like Nine Days better but now I’m leaning towards Addition. Thanks Luvviealex. Addition was – dare I say it surprisingly good! I wasn’t really expecting to like it as much as I did but I think she managed to play very cleverly with the chicklit genre. I think I probably like Nine Days better because of the breadth of what she has attempted and achieved – the social history, the multiple voices, the structure around the 9 days – but I can understand liking Addition better. It IS good.